Defying the possible wrath of both art lovers and the heavens above, officials in Encinitas, Calif., have decided to evict the Virgin Mary. And she has to take her surfboard with her. Because it didn’t have a public review process, the mosaic is legally considered graffiti. Council members say they personally like the piece but allowing it to remain on public property sets a bad precedent. 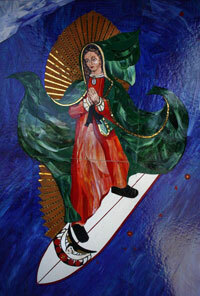 Some local businesses have offered to give the Madonna a home, and several “Save the Surfing Madonna” Facebook pages have been created. Download the Encinitas statement on the mural.